If you are thinking of preparing a dish with an exotic wild boar meat, then breeze through our list of Ground Wild Boar Recipes. Frankly speaking, there is nothing better than cooking those rear exotic meats that make melt your heart. Personally, I am pretty intrigued with them and so I love cooking them whenever I can squeeze time from my busy schedule. If you are also interested in cooking exotic meats, then let me assure you it’s not as intimidating as it sounds. With a little bit of care, you too can make impressive and wonderful exotic meals. Handling wild boar meat is somewhat different compared to other kinds of meat. It has to be fully cooked before you can have it, which is not the case in various other exotic meats. It contains very low fat, and so it dries off easily compared to other meats. Below are three of my most favorite Ground Wild Boar Recipes that I am sure that you will love too. Who doesn’t love bacon, and if you are a huge bacon lover like me, then I am sure you will totally fall in love with this dish. Below I have mentioned the recipe for this mouthwatering dish that will take your wild boar meat obsession to a whole new level. Fully mix all of the brine ingredients mentioned above and soak the pork belly in it for full 2 days. After 2 days, take out the belly from the brine and rinse it thoroughly with cool water. Using apple wood chips, cold smoke the meat for a couple of hours. Freeze the meat, slice it thin and enjoy the meat! If you want to take the experience to a whole other level, then try making caramel candies at home. You can put the caramel candies on top of the wild boar bacon to have an epic time. If you feel that making a wild boar bacon a pretty hectic task, or you are not a big bacon fan, then I recommend you braising it to make a super useful piece of meat that will serve multiple purposes. This one such Ground Wild Boar Recipes that makes the meat versatile, so that it can be used for a lot of things. The braised meat can be crisped on a grill, sliced for a sandwich, or can be used as a garnish for various kinds of salads. However, you decide using the meat, we all can agree on the fact that the buttery flavor is worth the effort. To start with the recipe, dip the meat in a brine solution overnight. Gently lay the belly pieces with their fat side down on the pan. Also, sear the meat to render the fat. Carefully flip the belly as soon as it gets a brown crust, and then immediately sear the other side. Put the pan in the over so that it braises for about one and a half hour. Until the meat gets tender, braising should be done. I get very excited when I get to have racks of meat. It is their presentation that appeals the most to me. The way big, charred lumps of meat dangles from the bone makes it look so delicious and mouthwatering. If you get your hands on a rack of wild boar meat, then you should definitely try having them with whiskey meats. 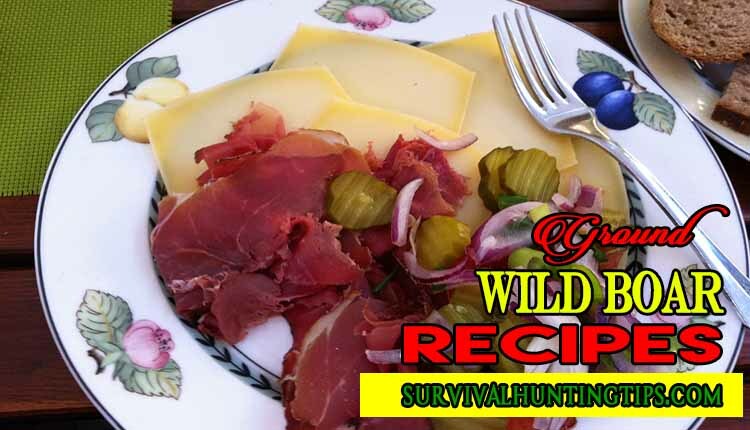 This is a great Ground Wild Boar Recipes that would appeal most to you and your family. Transfer the rack on to a-roasting-pan. Put a small layer of mustard crumb mixture on the meat by-patting it on the meat. Remove the rack from the pan and rest it for around 10 minutes. After which you can cut it into individual pieces. Take a saute pan and heat it. Add the sugar on the saute pan till it begins caramelizing, thus turning the mixture in a light amber color. Finally add the whiskey, -scraping out all the caramel from the-bottom of-the Now cook the alcohol for around 2 minutes. I am pretty confident that you will just fall in love with all of the Ground Wild Boar Recipes mentioned above. Being a lifelong meat eater, these exotic wild boar recipes appeal the most to me. Try these dishes on your own and make sure to share your thoughts in the comments below, if you loved reading the article make sure that you show some love by liking the post. Happy Cooking!! Who Needs Survival Skills Training When You Can Follow These Simple Steps?